Wood-fired Oven imported from Italy -- Restaurant PizzaArte -- (left). Because of the high heat in these ovens, a classic Pizza Margherita cooks in under 90 seconds -pizza from Fratelli La Buffala (right). 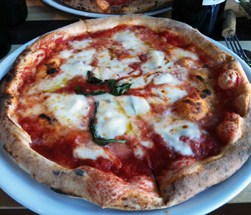 What is a Neapolitan Pizza -- During the past few years we have seen a surge of Neapolitan style pizza restaurants. These restaurants serve individual pizzas as opposed to pizza. If they are following traditional Neapolitan style they will contain fresh mozzarella cheese and tomatoes from the San Marzano. The pizzas must all be cooked in a wood oven stove. These wood (oak) fired pizzas add a unique taste that is not found with gas or coal cooked pizza. Note: Neapolitan style pizzas generally have less cheese toppings than American style pizza and have a noticeable soupy center in the pie which means be prepared to eat them with a knife and fork. Giuseppe Cangialosi, formerly of Emporio, heads up the wood oven pizza program at Osteria Cotta. Co. (Company) opened in January of 2009 under the direction of Sullivan Street Bakery owner, Jim Lahey. His "no-knead" technique gives a more airy chewy taste to his wood oven fired pizza. See New York Times article --Restaurant website with Menus -- yelp (3 1/2 stars) -- Zagat 23 --Gayot's top 10 Pizza's in New York. Rossopomodoro is a pizza chain from Italy that has branches all over the world. It is located in a back corner of the Eataly store. Roberto Caporuscio (read interview) the owner/pizzaiolo of Keste makes genuine Neapolitan style pizza. Keste is also the official location in the USA for APN (Associazione Pizzaiuoli Napoletani whose mission is to protect and preserve the Neapolitan pizza tradition and promote the art of pizza making. Note:..Robert recently opened Don Antonio with his maestro, Antonio Starita, third generation owner of one Naples’ oldest and most revered pizzerias, Pizzeria Starita a Materdei, have joined forces to bring authentic Neapolitan pizza to Midtown Manhattan at Don Antonio by Starita. --309 W 50th St (between 9th Ave & 8th Ave) New York, NY 10019 Keste website. -- Yelp (4 1/2stars) --Zagat 25 .--Gayot's top 10 Pizza's in New York. Lucali is a small restaurant with an open kitchen where you can easily see how the pizza is made. This is a BYO place.- Yelp Reviews (4 1/2stars) --- Zagat 26.--Gayot's top 10 Pizza's in New York. Forcella pizzamaker-owner is Naples born Giulio Adriani. -- new** williamsburg and now at the also has Bowery -- 3 stars nymagazine -- Note: Forcella translates to "fried pizza" --Adriani's Montanara pizza ($10), is a margherita made with a crust shaped and flash-fried before being topped and finished in the wood-burning oven. Slice Review -- Yelp Reviews (4 stars)- Website and Menu --Gayot's top 10 Pizza's in New York. --Yelp (3 1/2 stars) Website for Franny's -- Zagat 25 --Gayot's top 10 Pizza's in New York. Coal fired ovens (left) can only to had by inheriting in NYC restaurants. They produce a thinner crispier pizza than when cooked in a wood oven. Both oven and pizza from Luzzo's on 1st Avenue. What is a Coal Fired Oven -- .Coal-burning ovens are hot commodities for pizza makers since the only way to get one in New York City is to inherit it. 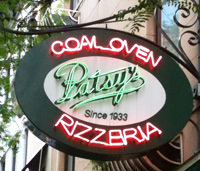 Coal fired ovens have a long history to pizza making in the US. New York City was the birth place of New York style pizza. Lombardi's which opened in 1905 was the first pizzeria in the United States, and it happened to use a coal-fired oven. One of the main differences between coal and wood comes not from the coal smoke but by the intense heat a coal fire generates. Coal provides about 13,000 BTUs of heat per pound, while wood provides about 6,500 BTUs per pound. Oven temperatures in a coal fired oven exceed 900 degrees imparting a characteristic char to the crust. In addition the higher heat lets the crust get crispier. 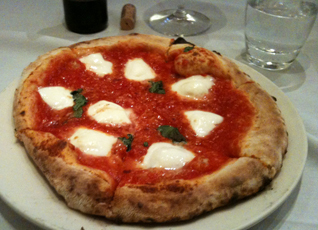 For 2012 Totonno's was rated the best pizza in New York City by Zagat's receiving a rating of 26. Located in Coney Island, Brooklyn since around 1926. Zagat Rating 26 -- See Zagat Reviews -- "...Every self-respecting pizza-loving New Yorker should visit the Coney Island original at least once in his lifetime..." read more from New York Magazine. Luzzo’s Bufala Quadratti is a paper thin 1/16? flat pizza that takes you straight back to Italy circa 1898. Fitting for a pizza cooked in a 120 year old oven.....Michele Luliano has long had a name for himself on the New York City restaurant scene. As the owner of Luzzo’s, he developed a cult following for the traditional pizzas he serves at the East Village mainstay. In 2010, he opened Ovest, a sister restaurant to Luzzo’s in Chelsea. John's of Bleecker Street was founded in 1929 by John Sasso, and the restaurant is still in its original location. 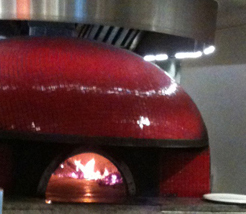 John's Pizzeria serve coal-fired, brick oven pizza, cooked in 850-degree ovens. John Sasso was one of the original bakers at Lombardi's. The walls are all carved out, and while the pizza is Ok, the place seems more about who you are with than about the pizza. Excellent thin crust pizza at numerous locations. Latest location is at 69th and First Avenue. Lombardi's which opened in 1905 was the first pizzeria in the United States. Expect long lines and lots of tourists. Lombardi's home page and menu, Zagat 25-- Yelp 4 stars. 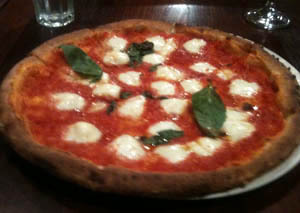 Verde Coal Oven Pizza -- 254 Irving Ave (between Greene Ave & Menahan St) Brooklyn, NY 11237 -- (718) 381-8800. 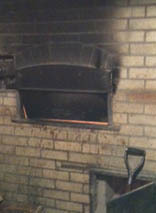 Charlie Verde born in Sambuca, Sicily, took possession of the 104 year coal oven and turned it into a pizzeria in 2011.